The maintenance of good health was of prime importance within the camp. Physically it was important to encourage the men to keep active, particularly as they were for much of their time detained in relatively small space. Some of the work they undertook daily contributed to this, particularly those who were active in the gardens or the work parties. For others, sport was encouraged, and recreation fields were made available where a wide variety of sports were played. Most notable though, are the large scale gymnastics demonstrations that were performed for the entertainment of internees and camp staff (see figure 67). Sporting clubs soon developed including football, tennis and cricket. 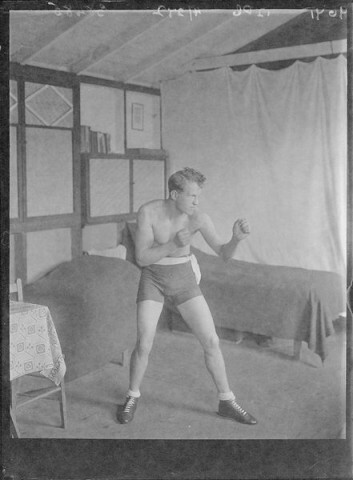 For the less able bodied and infirm Joseph Pilates was interned in the camp and spent his time developing his now world famous Pilates technique, particularly with the rehabilitation of hospitalised internees. Boxing, wrestling and gymnastics were very popular while sporting event days saw displays and matches along with more light hearted events such as the three-legged race enabling everyone to take part if they wished (Sports Letter, MNHL). Recreational space included areas outside the main camp, in particular an area of headland above Camp 4 where a rectangular area of levelled ground can still be seen today. This area also served as the camp golf course (see figure 68), while its location would have afforded the internees views out to see and across the plains inland. Mental health was just as important as physical health with the monotony of life in the camp causing depression, know within the camp as barbedwirelitis. This was one of the reasons why there was such a density of activities within the camp, as the less time one had to be alone, the slighter the chances of problems. Another way to support their mental health was through the upkeep of good personal hygiene and pride in their appearance. Many images show the internees well-dressed although it was unclear if this was for the benefit of the camera or a regular routine. Evidence from field walking suggests the men did at least have the means to take care of their appearance with fragments of toothpaste dishes, toothbrushes, combs, and razors. Unfortunately, not all men survived the camp and succumbing to a variety of diseases including syphilis, tuberculosis and influenza. The bodies of those who died were buried across the road in Patrick churchyard, nicknamed Camp 5 within Knockaloe. Following the war the majority of graves were moved to the war cemetery at Cannock Chase. Seven internee graves remain in Patrick churchyard however, those of five Turkish internees and two Jewish.